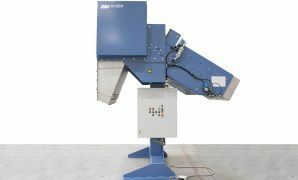 The VMI Extruder Feeder system automatically feeds compound strip to extruders. The system is designed to cut rubber slabs up to 900 mm width. It will cut these cold rubber slabs into an endless zig-zag cut strip. The strip will stay attached after this specific type of cutting, which makes it very suitable for extruders to process. The Extruder Feeder system’s sturdy design is suitable for extensive rubber hardness range. It has a long life-time which makes it a durable machine and a good investment. 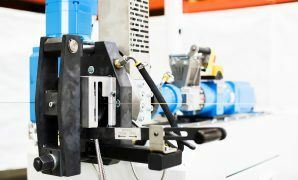 The driven inlet roller or optional conveyor pulls the rubber slab from the pallet and introduces it into the machine. A rotating knife cuts the rubber slab accurately into an endless strip. An on/off dancer roller controls the cutting making sure the endless strip is feeding an extruder continuously.